First week of August myself and 9 bici-almeria veterans set of from LHR to Innsbruck for our trip to the Italian Dolomites. After many years of visiting the great cycling regions of France and Spain, and having ridden a good number of the classic climbs – it was with great excitement and a little trepidation that welcomed me over the Brenner pass into Italy. My god those mountains are impressive. More like sheer cliffs than the stylised mountain shapes that a five-year-old might draw. Innsbruck airport itself beautifully previewed the week ahead, seemingly trapped in an improbable alpine valley, only reached by air via the most amazing descent and banking down a valley, towering rock on either side as we approached the runway. The view from the pilot’s seat must have been awesome! Then it was just busy motorway journey over the border to Bolzano where we based ourselves for our week in Italy’s greatest cycling region. I expected it to be hot, Bolzano is only 250m above sea level and in the bottom of the Adige valley. However I have now been informed by many locals that the last 3 weeks have been the hottest ever in the Dolomites! Nice timing for a group of pasty white Englishmen! Opening the doors of our hire cars on arrival at the hotel on the outskirts of the city was like stepping into a furnace, the heat of a summer’s day had baked all around to a whoppung 37.9°C – even the endless orchards of apples that surrounded us must have been nearly baked. One of the most interesting hours of any bike trip is the opening of bike boxes/bags and tentatively discovering whether the airline have made the first 24 hours of the trip a quest for bike repairs. Fortunately this was not the case and after a few kms on the roads nearby we had supper and planned for our first ride the next day. 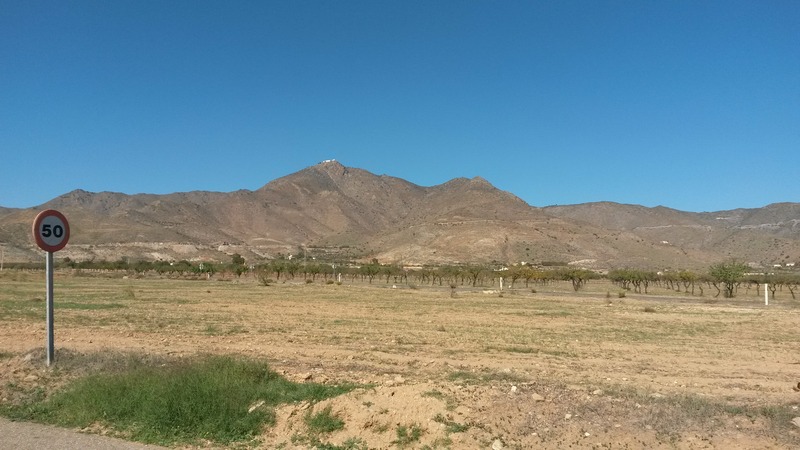 Our first ride was a simple and easy ride north from Bolzano to Merano and then up the Val Passiria – in Almeria I am totally in control of route planning, no road is an unknown. From the outset here in Italy it was pot luck whether the routes I had planned on RidewithGPS.com would be any good. The convoluted urban roads of Bolzano and a 3km stretch of dug-up road on the way out of town was, to say the least, an auspicious start. Then as we left the city behind the road wound its way up the eastern edge of the Adige valley towards Merano, all the while the vast rocky cliffs flanked us to our right and also not far across the valley – their partners looked down from the east. Merano was a delight, beautifully maintained flower-beds, cobbled streets, enchanting squares (and as we discover on a later day – a brewery that looked like somewhere that would be a place to visit in future) – it had the feel of a regency spa town – and later on we rode past buildings that showed us that it indeed had it’s own ‘Thermes’! After coffee we headed up the Val Passiria – although a very busy road, it climbed gently up a more open Alpine valley, cows munching on verdant pastures replaced the vines and orchards of lower down the valley. We turned back after 50km and after lunch in Merano took a different road back. Here we struck gold with route planning. A wide, quiet road through row upon row of apple trees bursting with ripe fruit of all colours. The town of Lana was particularly stunning. The baroque onion-domed church amazing against the azurri sky! These towers I have always associated with eastern Europe would be common place in the Dolomites! Day two of riding saw us head into the Dolomites for real, an hour and half drive up to Canazei – in the company of what appeared to be most of Italy on holiday! 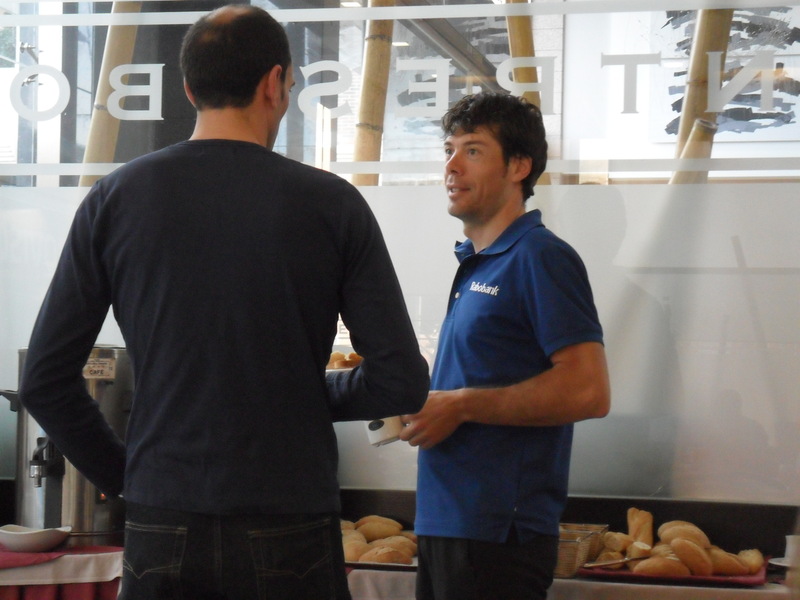 – to start the ride of the day which would include Passo Sella, Passo Pordoi and Passo Fedaia. We started a few kms earlier than planned as we encountered the first of many seemingly pointless accidents between high-powered motors that appeared to have impacted at low-speed! Canazei was bustling with cyclist, walkers and holiday-makers, it was also still resplendent in pink from the visit of the Giro a few months before. The group split on the ride today, the stronger and more optimistic took the Sella first, then Pordoi and finally the monstrous Fedaia, the more conservative did Pordoi first then back up the Sella. Either way it was a big day in the sweltering heat. For me Pordoi is one of the climbs that symbolises the mystical nature of the Dolomites – when we were planning the trip this was one Passo that had to be done. So I decided to head up Pordoi first and then back down and tackle the Sella – eschewing Fedaia in light of all the climbing to come in the coming days. Pordoi did not disappoint, stiff hairpins straight out of Canazei and some serious gradients. Resisting the urge to stop and take in the views- I promised myself some good photo stops on the way back down. As the altimeter approached 2000m for the first time on the trip, the massive silhouette of the Marmolada peak and it’s glacier loomed to the south, towering over the Pordoi which had sneaked into view up on the horizon. We re-grouped at the top and the selection was made – some went to on down the Pordoi to tackle the Fedaia from Caprile, I decided on the lesser of two evils and descended back towards Canazei before taking the fork north up to Passo Sella. The view from the top of Sella is possibly the most iconic of the trip for me, it sums up the Dolomites. Towering blocks of rock, contrasting grey with a celestial blue sky. As I stood at the top and looked back on the magnificent Marmolada, little did I know the carnage that Fedaia was reaping onto the strongest riders in our group. Tales of zig-zagging up savage gradients, stopping as there was no choice, Garmin auto-pausing, no gears left, stall speed … all these were re-told at the coffee stop in Canazei as we met up before heading back to hotel. These epic tales were retold many times that evening as we sample some marvellous local wines at the delightful Enoteca Bacaro in the Old Town. There were some tired bodies after the traditional battering that Day 2 of a bici-almeria trip seems to dish out year after year. Day 3 of riding saw up head west from Bolzano up into the Trentino Alps – the climb of the day was the Passo Mendola – a mere pup at 1360m above the city but in the 38° heat it proved a decent test over 15km after a 10km drag up out of the city to the base of the climb. The last couple of bends were particularly tough, as it always is when you discover a perfectly good funicular runs up the to the top of the climb. A couple iof the group returned to the hotel to recover from their efforts of this climb and the previous day’s exertions. The rest of us took a memorable descent down from Mendola to the shores of Lago di Santa Giustina for lunch at Cles. What followed was another piece of inspired, if fortunate, route-planning. We discovered perhaps the greatest piece of cycle path on earth from Mollaro to Sabino down the Noce valley. 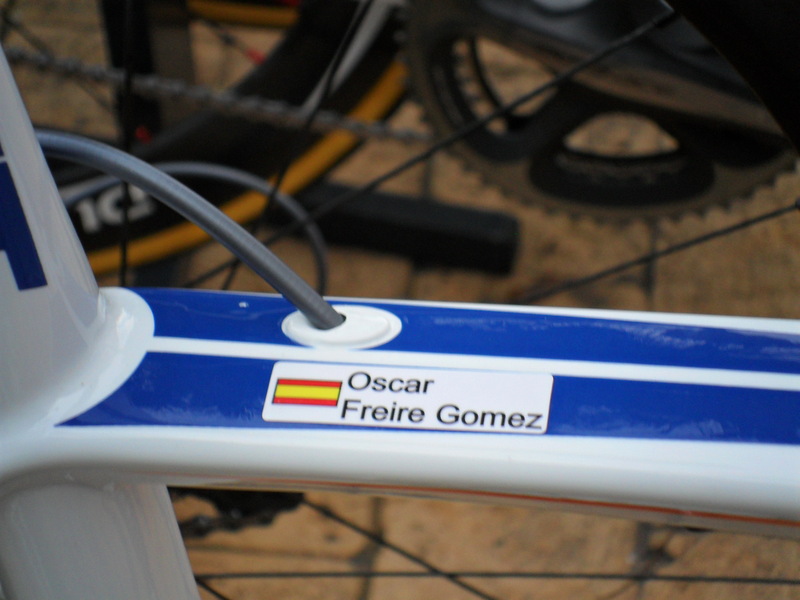 Amazing and technical, one to ride again and again! Then we entered the Trento vineyard region, passing through hectare upon hectare of vines, nice labelled and the Teroldego Zone, then the Pinot Grigio Zone. As a former wine-professional I had learned about the trellised pergola vineyards, this was a joyous opportunity to see them for real – and there were plenty! Finally we joined the Trento-Bolzano cycle path along the banks of the Adige and sped wind-assisted back into town, all the time looking down at the river, full of grey silt washed down from those towering Dolomites above us. Sunday was a wash-out, storms were forecast and it didn’t let us down. Plan was to head up to the Anterselva valley and ride from the bottom up to the Passo Stalle on the Austrian border. This would give a couple of us that are huge biathlon fans a chance to have a look around the Antholz Biathlon Centre. Well that was the plan … as we approached the foot of the valley and found somewhere to park up and get the bikes out, the first rumble of thunder entered the scene. As soon as I turned first people out of car park the first drop of rain landed on my forearm. By the time we reached a cafe 750m up the road, the heavens had opened, dramatic fork lightning surrounded us on all sides. Very soon it became apprent that there would be no riding today. In the 30 minutes we sat inside drinking coffee and sampling local delights – like apple strudel, apricot crumble tart and cheese and ham toasties – the temperature dropped from 25° to 12°C and the rain didn’t ease a bit! The next morning normal order was restored, skies were blue, breakfast taken early, bikes packed … however there was a sense of uneasiness in the air. Today was the big one – Passo dello Stelvio or Stilsferjoch. One of the cycling world’s truly iconic climbs – 48 hairpins from the Prato di Stelvio northern ascent, spread over a daunting 24.4 km at an average just under 8% – thas was serious. The Giro d’Italia has climbed this many, many times and each time it does it is Cima Coppi – the high point of the race – at 2760m above sea level. So we set off to get there nice and early, deliberately choosing Monday in the hope that it might be less busy in terms of petrolheads and motorbikes. Deciding to park up and have a 20km ride along the well-signed cycle park to the foot of the climb seemed a nice idea until the arrival of a 3km section of gravel meant a return to the busy main road. 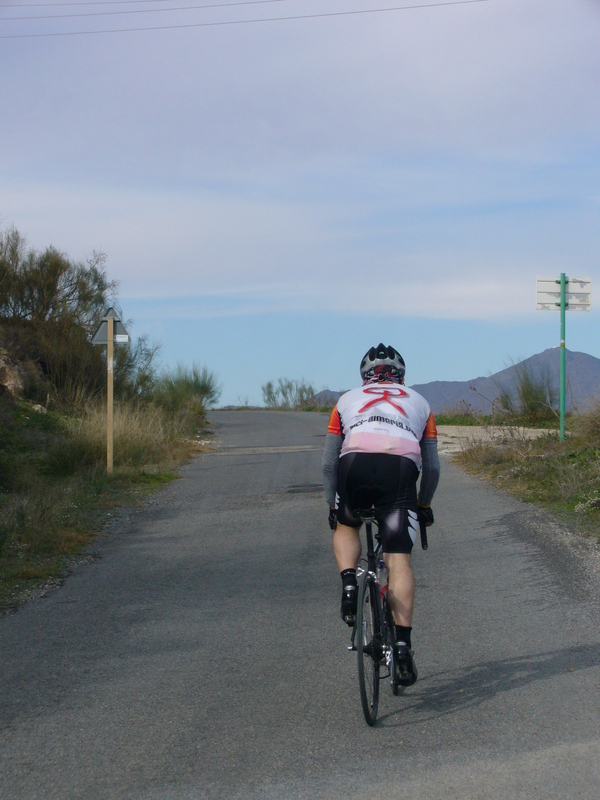 No bici-almeria trip is complete without a little dirt road (rambla) riding as all veterans will know! Personally I love it – Strade Bianche on my Bianchi!, but I understand it isn’t to everyone’s liking. So after a brief coffee stop it was onto the serious business of the Stelvio! It showed it’s teeth immediately but with a couple of exceptions at Tornante 38 and Tornante 4 the gradient was tough but steady. Again the ride was briefly interrupted by idiots in high-powered sports cards who had decided to collide head at a speed slow enough to avoid injury but doubtless keeping insurance firms, and the recovery truck happy – more of him later! So after the best part of two and tree quarter hours I reached the summit after enjoying the spectacle of a Lammergeier behind chased by a rampant flock of choughs! Any big mountain climb has a special feeling towards the top. The real legends have a deeply spiritual aura for anyone who rides a bike, Ventoux has it, the Tourmalet has it, the Galibier has it, for me LAgos de Covadonga had it on last year’s summer trip. Passo dello Stelvio has it in buckets. History, traditional, sheer brute force of nature – a place of sublime beauty and somewhere I would encourage all that like to ride to go while they can. After the obligatory fotos at the Cima Coppi memorial, which doubled as a Scarponi shrine this year, I rode gently back down the first 10 or so hairpins stopping to take some photos. However I couldn’t help but think how big the glacier that overhangs the Stelvio must have been 20 or 30 years ago, and more worryingly would it still be there for future cyclists to gaze at in awe in 25 years time. As the road corkscrewed ahead of me down the valley I had toiled up, I picked up speed and relaxed into the descent, passing bikes, buses and cars as I went. About halfway down I came up behind a row of motos following the tow truck that had retrieved one of the sports cars from the earlier prang. Every apex he pulled away from bikes and began to distance them so I passed them on a tight hairpin and got into his wake. Clearly this guy had done this descent many times before. The gap between us and the motos stretched out and I was quite gutted when he pulled aside 8km from the valley. A couple of us decided to have some fun on the return to the van by taking the cycle track and it’s exhilarating dirt track descents! So our last day of riding came along – another drive, this time south to the legendary Monte Grappa. We decided to ride it from the north from Caupo as this was the Giro stage route this year. Good friend of bici-almeria Mauro had ridden from Vicenza to join us for today’s ride. He was there waiting for us at the cafe in Arten at 10am as agreed. Another long climb – 28km according to the book, with ramps of 15-18%. Monte Grappa was steep from the start, not dipping under 9% much over the first 6km – then we reached a wonderful forest section that seemed almost downhill at 5%! Not long before we met a couple of pretty savage short ramps and then a quite long section of fast downhill. This would have been welcome, except we all know we were coming back ‘down’ this way so the 10% descent would return the favour! As the summit approached and the view south over the plains all the way to the Adriatic beyond Venice – it became clear why comparisons are drawn between Grappa and Ventoux. Approaching from the south it must appear omnipresent and ominous to all. At the summit 1714m above sea level is the beautiful yet haunting memorial to thousands of Austrian and Italians that died in both World Wars. Many, many thousands are buried up here in the stark, white mausoleum that is perched atop this mighty mountain. Yet another memorable trip with bici-almeria friends – one of the places I have always wanted to ride has been done and it did not disappoint. Obviously there are many famous climbs that could be added to the list. However the cycling is amazing even if the climbs are not so famous! Our last night meal was a return to the outstanding Gasthaus Fink in the old town of Bolzano – a place I would certainly return to and would recommend to anyone in the area to seek out. Amazing food, wine, service and amazing value. So here are my highlights from the trip. 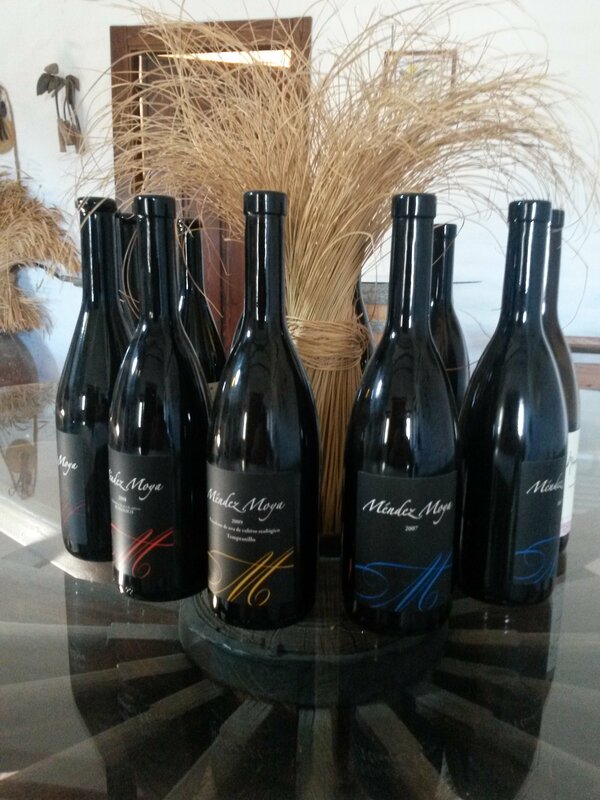 Wonderful, light fresh red wines of Trentino and Bolzano – my personal favourite was Cantina Bozen’s Santa Magdalena Classico Huck am Bach – delicious! The beautiful spa town of Merano – I would stay there if I ever go back to Trento-Alto Adige. Gasthaus Fink – as mentioned above – just what you need after a hard day in the saddle. Great food, value and service. Passo Pordoi – one of those climbs I have dreamed of riding, not sure why but it did not disappoint. Apples – I have never seen so many apples in my entire life. Antholz Biathlon Centre – although desolate, cold and wet – it still had sense of something special. I’d love to go when there is a event on! Monte Grappa – the sheer power of the Memorial at the top of the mountain. Street Pizza – best slice of pizza I have ever bought! After a blog hiatus I am going to make a genuine effort to keep this blog more current! Apologies to those of you who have been coming on here regularly to check out my perusals … not! 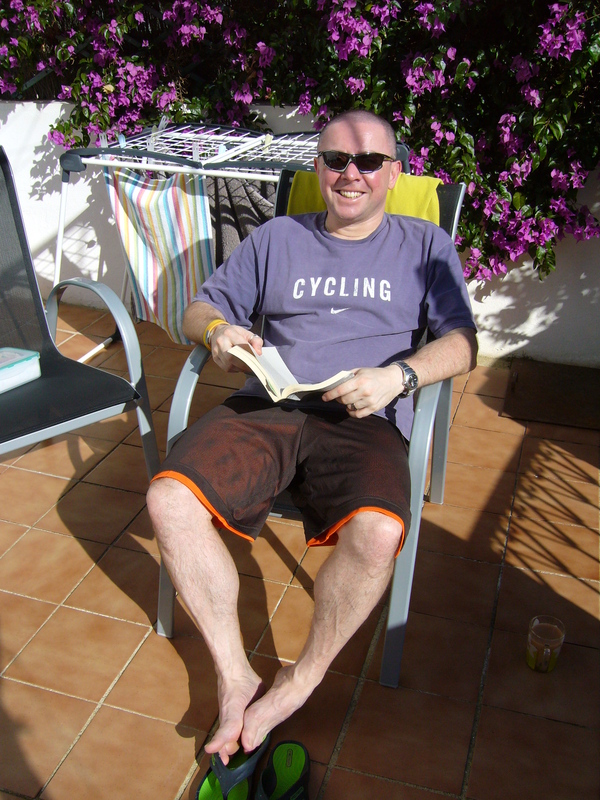 Well before the first real new post let’s catch up … so what has happened in Almeria and the world of bici-almeria since I last posted. Game of Thrones used Almeria (Alcazabar, Tabernas desert, Sorbas quarries, Torre Roldan and Cabo de Gato) as settings for Series 6. Little Mix also used it for a video but less said the better! 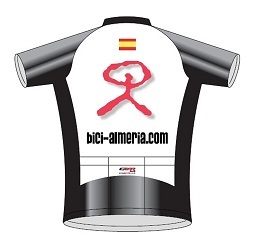 Classica Almeria 2016 & 17 ran in the west of the province, so away from the roads we use for bici-almeria.com trips. For the 2015 and 2016 bici-almeria trips we used a different place to stay. the splendid Casas Rurales de Tabernas, owned by the family of Oro de Desierto olive oil producer. We took a break in 2017 – no bici-almeria trip proper – however a sizeable group of previous clients and I are heading to the Dolomites in August, so the group lives on. As usual in Almeria, many roads have been beautifully resurfaced recently, including the climb out of Lucainena up to Turrillas, the southern side of El Chive down to El Puntal and the great road up to Fuenblanquilla. Finally a plug for a book written by Sorbas-local ex-pat Kevin Borman which I recently discovered – Flamingos in the Desert – an excellent read that really hits the spot for anyone who has visited the region – mentions of Bee-eaters, Rodalquilar gold, Palomares, Ghost airfields, threshing circles, camouflaged cars and Strawberry Fields mean little unless you have spent time here! Thanks to Kevin for summing it all up so well. Well worth a read. So that’s how much happens in Almeria in a couple of years – but that really is the beauty of the place – it is so unspoilt. despite weather that was slightly more unsettled than that we have had in the previous 6 annual visits, we did still manage to ride every day for both of the weeks that guests were with us. in order to be closer to the big ride climbs featured in cyclist bici-almeria found new accommodation near the village of tabernas – about 20km from our old hq in sorbas. we really did strike gold on the accommodation front – a magnificent, private selection of re-furbished cottages in their own secure, wooded compound set back 150m from the main road between sorbas and tabernas. please take this in context – main roads in our part of almeria would be considered positively deserted in the uk. 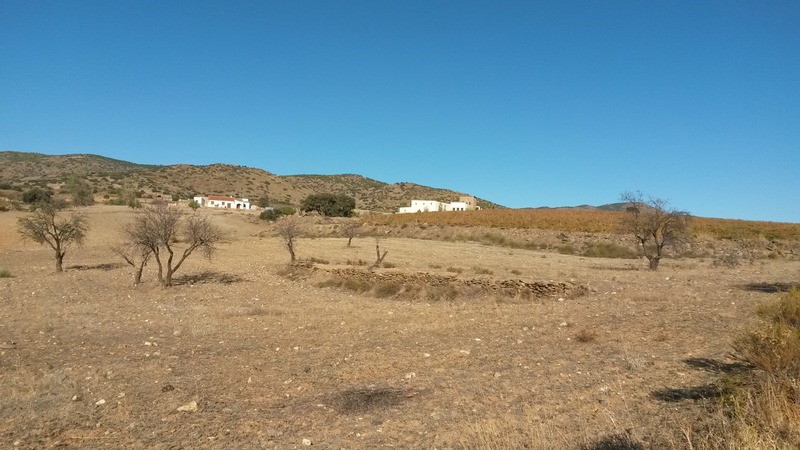 casas rurales albardinales are owned by one of almeria’s finest olive oil producers oro del desierto, which is located just across the road. lovingly restored to a magnificent standard the six cottages are named after the six important olive varieties – arbequina, picual, hojiblanca, cornicabra, lechin and blanqueta. these were set in a small, secure, gated wood with lots of outdoor relaxing space, a well used outdoor cooking area, shaded car port and of course, a very big swimming pool. the only real noise was the enormous variety of ornithology that shared the place with us! Rides this year varied in length, from a 50km cold one that had to be abandoned when the temperature at the top of the first climb (1000m) dropped to just over 5˚C, to the epic velefique and calar alto double header of over 6 hours and 150km. as always all riders got to ride at the pace that suited them, whether it be flying up the climbs or taking it steady and making sure they were able to ride again the next day. • finding a local restaurant had some izadi 2001 crianza on list and it was delicious! One of the trickiest bits of the bici-almeria annual training camp/holiday trip is creating, designing and sourcing a jersey for each year. 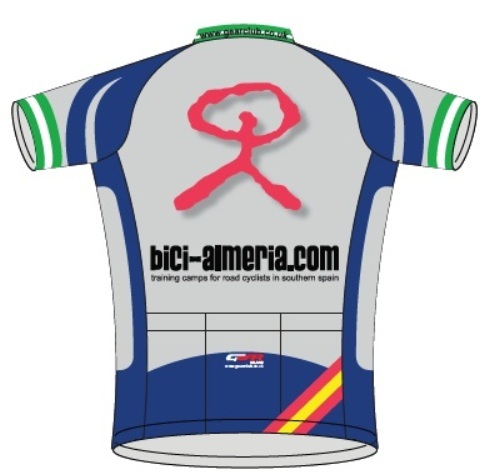 Obviously it is only a tiny run in terms of kit orders but for the bici-almeria spring week it is one of the key ingredients to a good group vibe. For the guests it is nice to have a momento of the trip, for me as the proprietor it is exceedingly fulfilling on ‘kit day’ seeing a group resplendent in bici-almeria kit on the magnificent roads of Almeria, it matters not whether there are 3, 6, 10 or 16 riders – the buzz cannot be overstated! In 2010, following on from a successful inaugural small group trip in ’09 – I decided to kit out the trip for the first time. 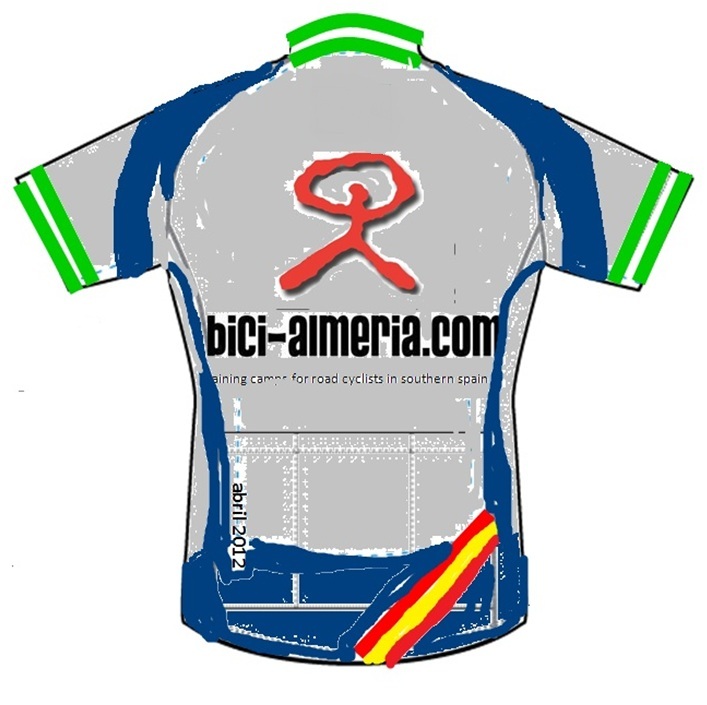 Gear Club were producing kit for Reading CC at the time so I approached them for a small run of bici-almeria jerseys. 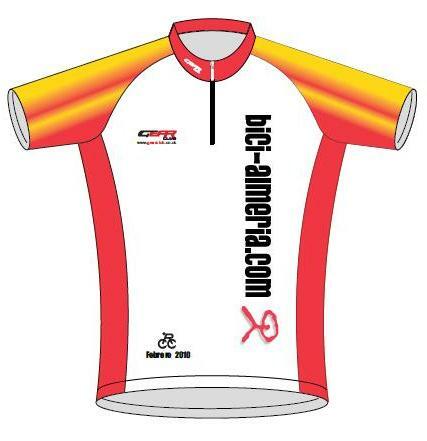 We came up with a simple white jersey trimmed with a very Iberian red and yellow theme. Like all subsequent jerseys, the red indalo figure has pride of place. The 2011 jersey was a identical in design but the colour theme moved from red/yellow to a black & grey theme. In 2012, for what turned out to be the last time, Gear Club again provided the jerseys. This time I went for something quite different. Deciding against a black jersey, my heart was set on something like the classic Caisse d’Epargne / Illes Baleares jersey of the late 2000s, as the Almeria sun really is quite hot even in April. So I took a punt on a grey/silver based jersey, incorporating blue trim and green/white/green bands and collars to represent Andalucia, as well as a very natty Spanish flash on on the rear pocket! Bibshorts were also made to match. 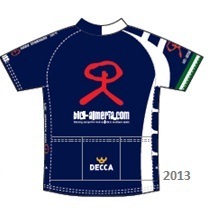 In 2014 Decca again supplied the kit, the chosen theme this time was Cervelo Test Team from 2009. Back to a mainly white design that proved popular with the group. 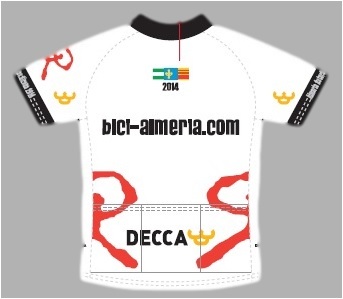 We also had custom bibshorts made up by Decca in 2014. 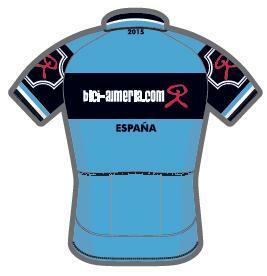 2014 bici-almeria jersey … love it! Castillo de Tabernas – having driven past it every time we have arrived in Almeria since 2008 we finally got round to climbing the footpath up to the ruins of the Moorish fortress of Tabernas. Looks much more impressive from the road below than it actually is when you get up there, the views however are magnificent. Sierra de Alhamilla to the south, Sierras de Gador & Nevada to the west and the Sierra de los Filabres to the north, with its Calar Alto telescopes gleaming white at the top! Hollywood in the Desierto again! Following Ridley Scott’s Exodus being filmed in the region last year, another epic Claudius is currently shooting in Almeria and Tabernas, starring Joseph Fiennes the region this time features as the backdrop for the might of the Roman Empire! First snow! Despite toasty temperature during our week in Almeria it was clear that the highest peaks of the nearby Sierra Nevada had already been cold enough for an early dusting of the white stuff! For my second ride of the week, and a non-car assisted one at that, I wanted to check out a road I had heard about and seen from above on a previous trip whilst walking! 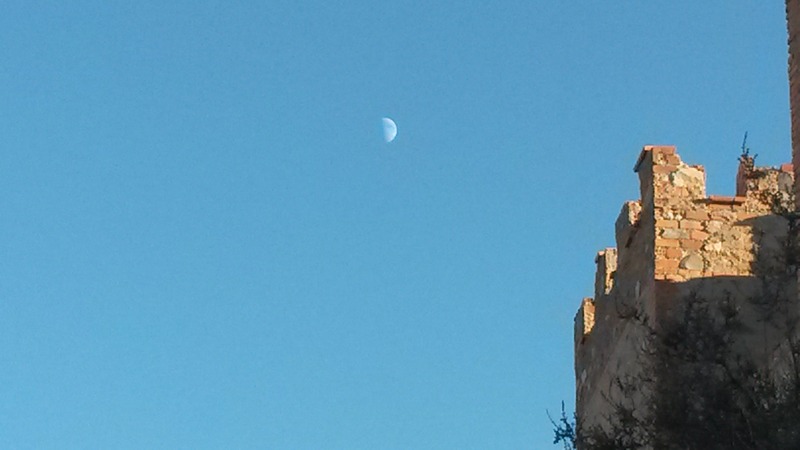 The closest mountain to my home in Sorbas is the Puerto de la Virgen. Usually tackled from Uleila del Campo and is a favourite of mine, and also many previous guests. However on a recent trip Lisa and I walked from the ‘puerto’ to the summit and the Ermita perched precariously on top. Taking in the stunning 360˚ views I couldn’t help but notice a narrow strip of tarmac snaking its way up towards us from the village of Benizalon in the next valley. I, of course, made a mental note to give it a bash at some stage before April 2015. This meant that for my ride I had to head from Sorbas north to Uleila then, rather than scale the Puerto de la Virgen, head back south to the base of the climb up into the Sierra de las Filabres to the village of Benizalon. This climb has been missing from our itinerary since 2013 as we found the road surface had gotten too broken and rough (please remember that this in the context of Almeria roads!) However since our last visit in March 2013 the Diputacion de Almeria (local government) had been out with one of their fantastic road building teams and the result is yet another super smooth strip of new tarmac winding its way sinuously up the mountain side. The climb up to Benizalon is quite a tough one in itself, just under 8km from the junction to the summit – the first 2 km are flattish – then it ramps up from 659m to 1020m in 5km (7%). 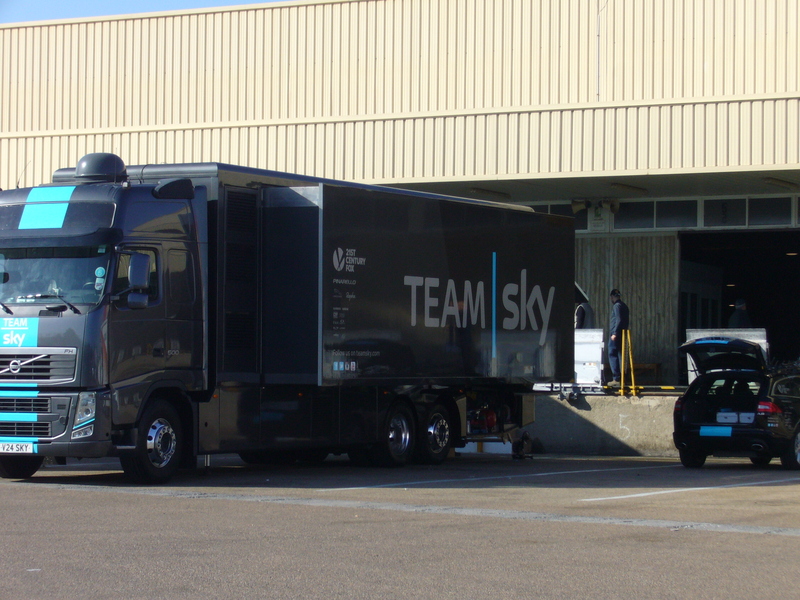 In the 26˚ midday October sun it was pretty tough going even with a silky smooth road under my wheels. A quick downhill blast brought me into Benizalon, and I nipped into the always busy, Bar Leonora y Jaca for a coke. Even by their standards it was particularly busy today! Then navigating a maze of tiny streets I found the narrow road out of the village towards the Ermita Virgen de la Cabeza, a distant white precipice atop a towering peak looking out over the whole locale. The track, tarmacked beautifully of course, is primarily used for an annual Easter procession, on foot, from Benizalon to the Ermita, carrying a statue of the lady Virgen herself. It is however a great road for us cyclists, After giving up trying to work out where ahead of me it went next, I just carried on climbing, suddenly rounding a bend and finding myself crossing a ridge on the southern edge of the sierra, a sharp drop down to my right but with stunning views over Uleila and extending to Sorbas and even the coast in the heat-hazed distance. The road suddenly darted back round the northern side of the ridge and there was the white pinnacle, the Ermita, ahead once more. I was reminded of Ventoux and how the tower their seems so near and yet so far, seemingly moving with each bend in the road, disappearing from view then suddenly there like some mystical genie of the mountains! A series of hairpins followed and the gradient leapt into double-digit figures maxing out at 14% for a short while! Then under the literal nose of Ermita itself, about 1km from the summit, a travesty! The sudden end of the glorious smooth tarmac, replaced by loose shale-like gravel. Despite my best efforts it was virtually impossible to get any real traction on a road bike, certainly it would be ridiculously difficult to safely descend back down. So, slightly dejected, I turned and headed back down to Benizalon, skimming round the hairpins and then hurtled down the sensational, ribbon-like descent down the mountain, no cars passed me on the way up, I don’t think any came towards me on the way down. Then back to Uleila and home to Sorbas. Such a shame that the tarmac ends preventing road bikes reaching the white Ermita itself, leaving the rider stranded almost within touching distance of what hundreds of Easter pilgrims reach on foot each spring! Still, like most climbs in Almeria, it is worth it all the same.